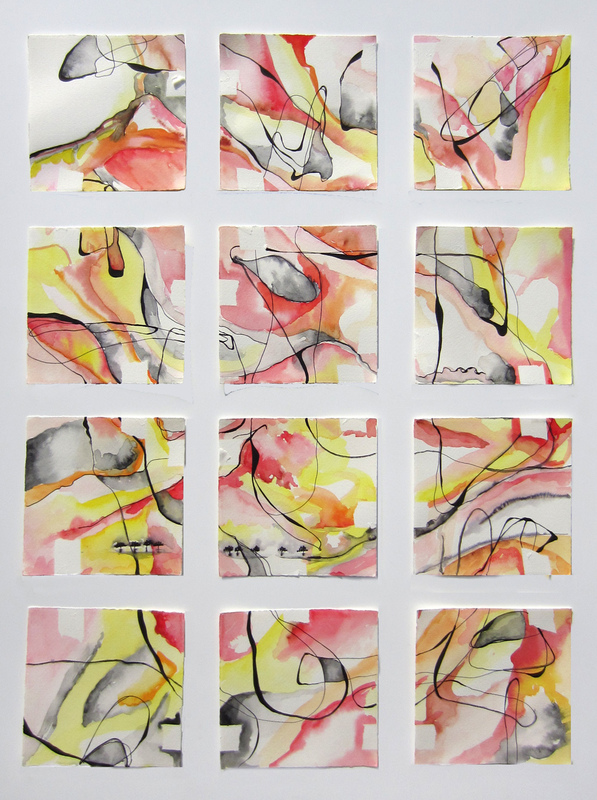 Each square 4.75 x 4.75″ Ink and watercolor on paper. I like the idea of displaying these on the wall w/tacks so they can be easily rearranged and spaced as you like. I had a lot of energy yesterday. Some of it was anxious – I think due to some lingering projects that just don’t seem to be going away – but a lot of it was a result of an eagerness to figure things out and to create. I have a notion all of the energy kind of balled up, conglomerating and morphing into day 47’s project. I’ve got to say, I’m pretty happy about it. Starting in on the piece, I didn’t have a vision as to what the finished work would look like, but I did have an approach in mind. Similar to the exploration in some of my other projects, I thought about how pieces and details come together to create a whole. This time, though, instead of keeping the whole intact, I broke up the whole into 12 separate, yet connected pieces. I really dig the result. It was a really fun/interesting one to work on. Thanks so much, Yelena!